A question was posed to me the other day: "Is Steve Sarkisian (head coach for UW's football team) worth the money we're paying him?". For the record, his salary is currently around $2.25 million, though he's not paid by tax payer money. The question of an employee's worth intrigues me. No doubt people have strong opinions/feelings on the matter. How do we quantify this to answer it objectively? 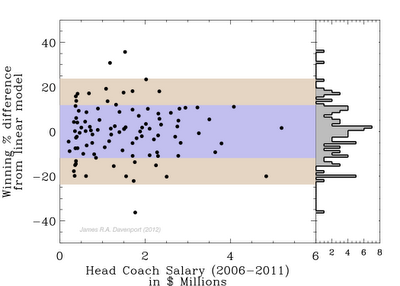 Still, football coaches are often judged based on their team's performance. So I decided that the best way to answer the question was to compare the salaries and win/loss records for NCAA FBS (aka Division I-A) coaches. Detailed data on coach salaries wasn't super easy to find, I would have liked to find a neat & tidy table with salary broken down by year for each coach, alas. 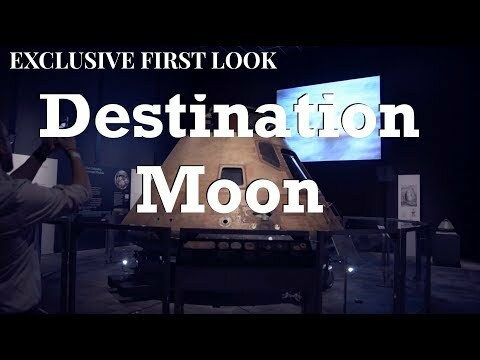 I did find this nice compilation by USA Today. I grabbed win/loss stats here. Note: for my analysis I have not followed up on any of these stats/teams individually, so no doubt there have been hires/fires and raises/cuts which will affect the specific details. The correlation between higher pay and better winning percentage is promising. The median salary is $1.46 million. Texas is doing well, but boy they're paying for it! I then subtracted a linear fit (dashed line) from the winning percentages to determine the typical scatter. The standard deviation in winning percentage at a given salary is +/- 12%. All the coaches that fall within this "region of acceptable performance" are highlighted in purple. I believe these coaches are "worth it". Twice the standard deviation is gold/yellow. Coaches in this region should either be asking for a raise, or watching for the hammer to fall. There are a few major outliers that bear mention. 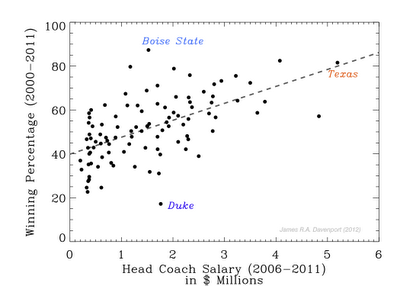 Boise State is getting a whopper of a deal (as noted in Fig 1), as well as Ohio State. 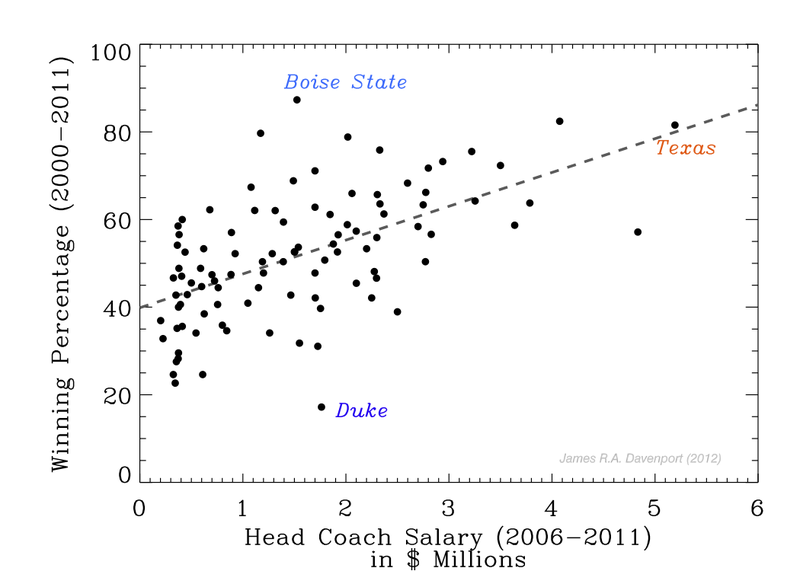 On the unfortunate side, Duke is very far below par; the sole outcast in the negative 3rd standard deviation. This doesn't bode well for an athletics program under scrutiny to dial back costs. So this has all been in good fun, and I certainly hope no one is actually fired on my account! 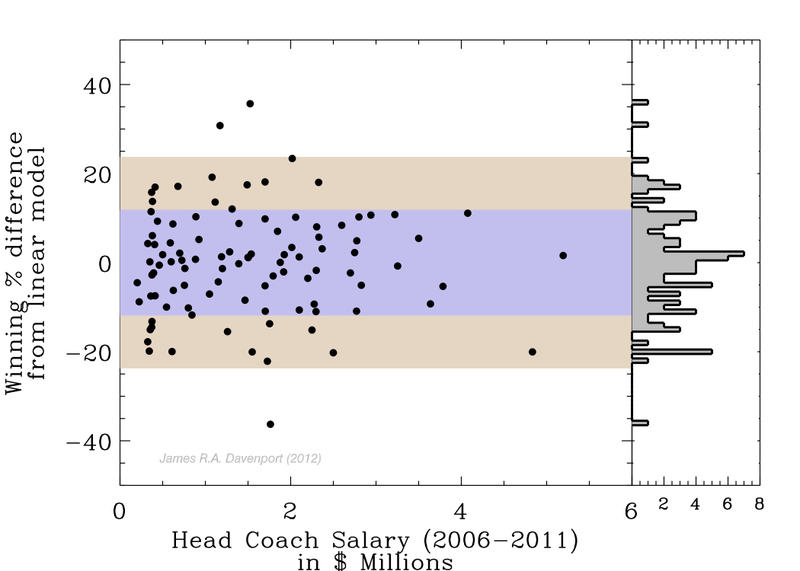 Looking at Washington in particular, Sark seems to be just below the standard deviation, but in fairness he's only been coach since 2009. After our victory over Portland State this weekend, I'm hopeful he'll make up some lost ground this year! NCAA Div I-A Football. Salary in $ millions. I just noticed that it's using team stats for that period instead of the coach's actual win percentage. That's why so many of the numbers are incorrect.